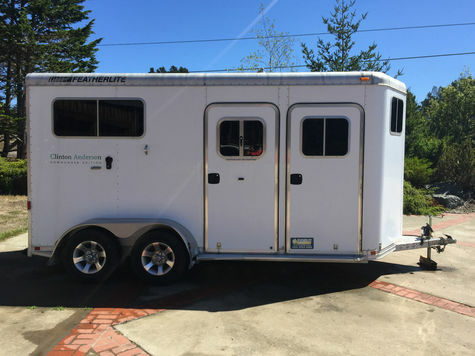 Selling a 2006 Featherlite bumper pull two - horse trailer. This is the 9406 Clinton Anderson Down-under Edition. The tack room includes a full-length oak mirror, 2 adjustable saddle racks, hooks and a spare tire. There are two escape doors on either side of the trailer, allowing for optimal safety and easy loading/unloading. The trailer has had one owner and was purchased through a Featherlite dealer. Inside Height 7 ft. 6 in. Width 6 ft. 7 in.